If you grew up in the heyday of bubble perms, mullets, and Route One football in Britain, you'll probably know all about soccer magazine, Shoot!, once the bible for all soccer fans growing up in the 1970s and 1980s. In true celebration of the classic stars and styles of a soccer era before the multi-billionaires took over, slot developer Microgaming launch a slot based on the classic periodical. A 5 reel, 50 pay-line slot, Shoot! has plenty of photo-realistic images of footie stars over the years, and a maximum jackpot of $20,000. On the reels we get pics of the greatest soccer players ever to grace the field - such as Maradona, Cruyff, Beckenbauer and Pele - and Kevin Keegan. Completing the reels are icons of the '70s game like soccer rattles (does anyone actually use a rattle anymore? ), an old-school soccer ball, and the trusty half-time meat pie. The Shoot! logo acts as the game's Wild, and substitutes for all symbols other than the Scatter, in this case the 'Bonus' icon. Three, four or five Scatters triggers the Trade 'em Bonus Game, a celebration of the classic Panini football stickers. Here, you'll be presented with a set of 12 pictures of all-time footie stars (and Kevin Keegan) - simply pick four out to uncover random hidden cash prizes or trigger one of two extra bonus games. First, the Magazine Bonus shows 12 classic covers from Shoot! 's back catalogue. Once again, keep picking covers to reveal bonus wins until you hit the Red Card and your go ends. The other hidden extra is the Free Spins game is triggered by - you guessed it - a Free Spins icon. A free spins number will be triggered at random for this. Soccer fans have been well-served over the years by developers, with lots of authentic slots tapping into the global fascination with the game. Playtech's two takes on the classic Top Trumps card trading game - Top Trumps World Football Stars and the similar Top Trumps Football Legends - are probably closest in theme and style to Microgaming's effort, and should be top of your list if you're a football nut. If the thought of winning a potential 619,000 coin-jackpot sounds good to you, then Shoot! 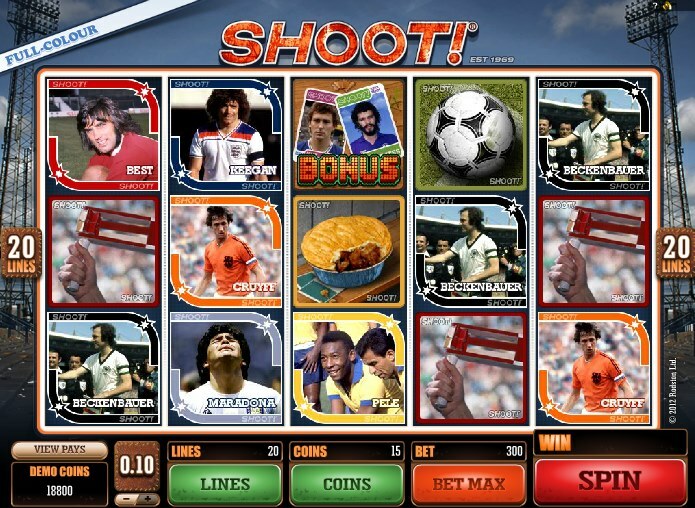 will probably appeal to any slots aficionado, regardless of your affinity to the Beautiful Game.